3 Comments Published by Cedric Benetti on Friday, July 24, 2009 at 7/24/2009 04:38:00 AM. 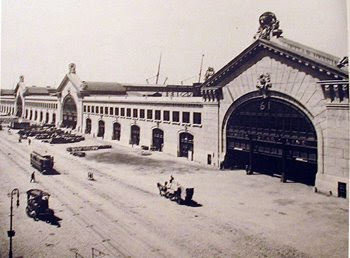 Pier 54 was one of a set of piers running along the West Side of Manhattan from West 12th to 23rd Street that made up the Chelsea Piers that was completed in 1910. It was designed by the architectural firm of Warren and Wetmore, which also designed Grand Central Terminal. In April 1912 following the RMS Titanic sinking the RMS Carpathia picked up survivors. The ship first went to the White Star piers where it discharged the Titanic's lifeboats that had been brought aboard before coming back to Pier 54 to discharge the passengers. The pier continued luxury liner service until the 1930s when a luxury liner row was built between West 44th and West 52nd Street to handle larger liners. 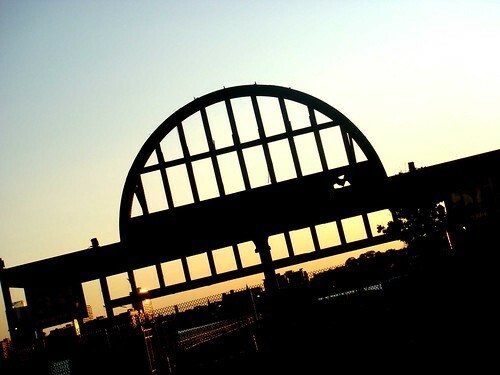 In 1991 the structure was torn down although it remained an open air pier and the entrance archway was preserved. A faded sign on the archway notes the name of the merged Cunard White Star line. The Titanic is the reason I won't go asea. In August when I attend a wedding in Jalolla CA. I won't be going into a boat either becauseof giant humbolt squids and great white sharks. Won't be sticking my pinky toe in. Anyone have those THC lollipops and I might stick in a stick. Can you pop over to San Diego for a few days in Aug. 19-23rd. Big ocean wedding - lot's of fun. Forgot to say, The groom is an architect working with Walter Cunningham, famed and the darling of Architectural Digest. His home designs are very modern up in the hills around San Diego. The wedding will be at a club with the ocean backdraft for the ceremony. Come see.